Although this Raspberry Sauce (Puree) and other fruit sauces are a staple in most commercial pastry kitchens, they are often overlooked by home bakers. What most people do not realize is how wonderfully intense the flavor of homemade Raspberry Sauce (puree) can be. I love its sweet yet tangy raspberry flavor and I find it rivals the flavor of fresh raspberries at their peak. In fact, this raspberry sauce does not even use fresh raspberries, instead frozen unsweetened raspberries are used which luckily are available year round and at a reasonable price. The reason I use frozen unsweetened raspberries, rather than sweetened raspberries, in this sauce is because I want to be able to control the amount of sugar in the sauce. I also like to use frozen raspberries as I find their flavor is consistently good. That is because the berries are picked at their peak and then quickly frozen. Also, unlike fresh fruit that spoils very quickly, fruit sauces will keep in the refrigerator for at least a week and can even be frozen for several months. Raspberry sauce has many uses. For a quick weekday dessert it can be simply poured over a bowl of ice cream or frozen yogurt. I also like to use it to make the kids a delicious smoothie or maybe even a milkshake. You can fold it into whipped cream for a raspberry flavored cream. It also is very nice when poured over chocolate desserts or a variety of other plated desserts. 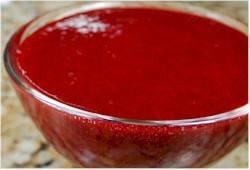 Raspberry Sauce (Puree): Thaw the unsweetened frozen raspberries in a fine meshed strainer placed over a large bowl. (This will take a few hours at room temperature or you can defrost the berries in the microwave.) Once the berries have completely thawed, force the juice from the berries by gently pressing the berries with the back of a spoon. (All that should remain in the strainer is the raspberry seeds.) Throw away the seeds and, to the strained juice, stir in the lemon juice (if using) and white sugar (add more if needed). Can be covered and stored in the refrigerator up to a week, or freeze up to a year. Makes about 3/4 cup (180 ml). Preparation time 20 minutes.